17th December, Riyadh: Newly-crowned AMF World Cup champion, Syafiq Ridhwan won his third international title this year with a victory in the Men's Open Masters finals of the 40th Penang Pesta International Open Bowling Championship. His first title this year was the 12th Chinese Taipei Open in November before moving on to Wroclaw, Poland to capture the most presitgious AMF World Cup title early this month. And less than two weeks later, the 26-year-old was on the top podium again winning the Penang Pesta Men's crown. Syafiq over-turned a 25-pin deficit from the first block to leader, Muhammad Rafiq Ismail to win the title with 5221 pintalls in the second block round-robin matchplay finals. The champion won nine of the 12 matches contested. Muhammad Rafiq, who won eight matches for a total of 5080 to settle for second position while 2012 ABF Tour Hong Kong leg champion and ex-international, Kang Bo Long completed the podium with 4935. National bowler, Syimir Abdul Razak and national elite squad member, Muhd Nur Aiman rounded up the top 5 with 4899 and 4774 respectively. 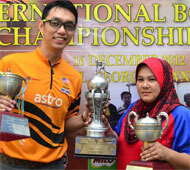 Meanwhile, Rosnani Ramli of Kuala Lumpur, shocked the local bowling fraternity by capturing the Women's crown with 4469, winning nine matches in the 10-game round-robin matchplay finals. Rosnani beat this year's Daejeon Open champion and national elite squad member, Esther Cheah by 56 pins. National youth, Faten Najihah finished third with 4355, a further 68 pins away. Victoria Chin of Malaysia and Clara Lau of Singapore made up the top 5 with 4258 and 4213. Syafiq was richer by RM15,000 after his victory as Muhammad Rafiq and Kang zbo Long picked up RM7,000 and RM3,000. Rosnani won RM10,000 for her maiden victory while Esther and Faten earned RM4,000 and RM2,000. Photos courtesy of B.C. Cheah.